Vermont Public Radio fans in Montreal can exhale. At least for now. On Monday, the CRTC denied an application from Concordia’s CJLO to add an FM retransmitter at 107.9 FM, which would block out VPR in downtown Montreal and an arguable radius around it. This is consistent with a previous decision allowing CHLT-FM in Sherbrooke to move to 107.7 FM despite interference problems it might cause VPR listeners in the townships. 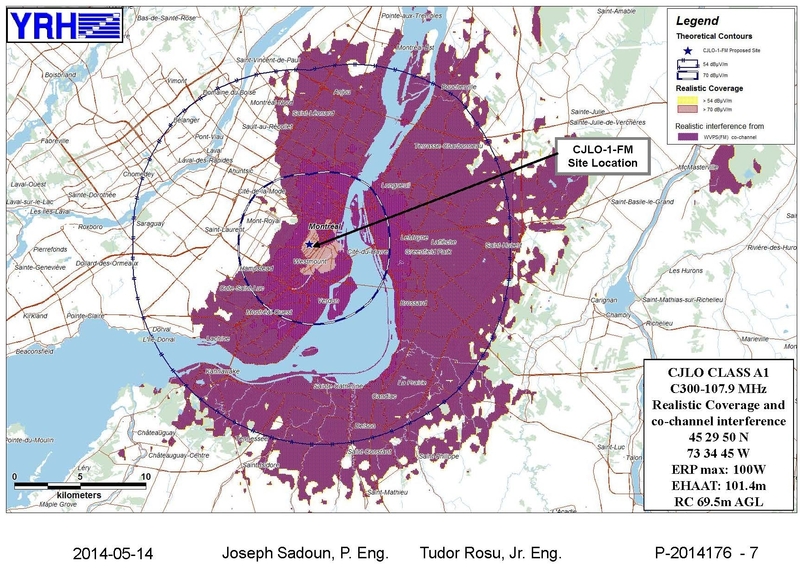 Instead, the CRTC determined that CJLO had not presented a compelling technical need to get the new allocation, particularly since 107.9 would be one of the last frequencies available for a station in Montreal. More about this decision below and in this story in the Montreal Gazette. Since the announcement last month that Concordia’s CJLO radio station has applied for an FM retransmitter downtown to allow listeners at the downtown campus to hear it, but would block out Vermont Public Radio for many more, there’s been a lot of questions, debate and differences of opinion about this proposal. The CRTC has already received 645 interventions, almost all of whom are radio listeners who support one side or the other. The majority are VPR listeners responding to the organization’s public call-out on its website. Others are CJLO fans who want to be able to hear the station on the downtown campus and say this is the only practical way to do so. In most (but not all) cases, the interveners don’t have bad things to say about the other side. The VPR fans hope for an alternative solution to the reception problem. Both CJLO and VPR say they support the other and don’t want to prevent anyone from being able to listen to the other. I look a bit deeper into this application in this story for The Gazette, which appears in Friday’s paper. Below, I’ll tackle some of the questions and perceptions that people have and try to come up with some unbiased answers to them. A rough guide to the range of the proposed CJLO FM transmitter. Red areas would experience interference from WVPS in Vermont. After much study, Concordia student radio station CJLO 1690 AM believes it has found a solution to reception problems it is experiencing at the university’s downtown campus. A long-rumoured application for a low-power FM retransmitter was published Friday by the CRTC. If approved, the transmitter would operate on 107.9 FM, from an antenna on the Henry F. Hall Building, at 100 watts. The frequency is one that has been previously identified as potentially usable in Montreal, but it comes with one big downside: It’s the same frequency as WVPS, the Vermont Public Radio transmitter in Burlington, and the only U.S. public radio station that reaches into Montreal. Because of co-channel interference from the 48kW VPR transmitter, the CJLO FM retransmitter would have a very limited range, basically covering the core of downtown and not much else. On the other hand, areas around downtown will experience a great deal of interference, likely hearing both stations at the same time, and neither very well. (I can’t get too specific about this because the maps submitted with the application are blurry and black-and-white because they were sent by fax). Though VPR’s 107.9FM signal reaches Montreal remarkably well, it is not protected in this city. We learned this two years ago when a proposed station in Hudson offered 107.9 FM as an alternate frequency if its first choice of 106.7 was rejected. The CRTC received some comments from VPR listeners upset at the potential of no longer being able to hear that station. CJLO’s AM antenna on Norman St. Increasing its power, or putting a transmitter like this downtown, are impractical solutions to downtown reception problems. CJLO’s report, prepared by broadcasting consultant Michel Mathieu, notes that signal strength readings were taken along Sherbrooke St. and de Maisonneuve Blvd. downtown, and they showed that the signal is particularly bad in the heart of downtown where Concordia’s downtown campus is. The signal starts dropping around Atwater St., and returns around Berri. The reason? Downtown skyscrapers absorbing the AM signal. Even Laval, more than twice the distance away, shows a signal 10 times better than in some downtown blocks. In case the quantitative data isn’t enough, the application also includes a dozen letters from CJLO listeners complaining of the signal quality downtown. Increasing the power of its 1,000W transmitter in Lachine’s St-Pierre district was rejected because it wouldn’t solve the problem. Even TSN 690, operating with giant towers at 50,000 watts on a clear channel, has signal reception problems in downtown buildings. An AM repeater (it’s unclear if this would have been on the same frequency or another one) “became out of the question” because of practical and cost limitations, being unable to put a 75-foot antenna on top of the Hall Building. CJLO’s application can be downloaded here (2.8MB .zip file). The CRTC is accepting comments on CJLO’s application until 8pm on May 26. They can be submitted using this form. Note that all information submitted, including contact information, becomes part of the public record. UPDATE (May 4): CKUT’s International Radio Report devoted its show on Sunday to this application, with comments from supporters of CJLO and VPR. You can listen to the show here in MP3 format. Meanwhile, VPR is warning its listeners about the CRTC application and its consequences. Concordia’s radio station is actually celebrating two anniversaries this year: It was created 15 years ago through the merger of two closed-circuit radio stations on the university’s two campuses. And it marks the fifth anniversary of its broadcasting at 1690 AM. So it’s organizing a concert on Oct. 25, featuring Wintersleep, Fucked Up and Cadence Weapon. You can buy tickets here. And on Saturday it’s hosting a party to end its artist outreach program, which created EPs for local artists thanks to a grant from the Community Radio Fund of Canada. On the air, the station has undergone programming changes that happen with the student renewal that happens every fall. You can see the whole schedule here. CJLO recently had its licence renewed to 2019. It’s been making waves about technical changes to improve its coverage, possibly a low-power FM transmitter downtown, but nothing has been published yet. While I was watching intently at a hearing in Montreal where BCE was making its case to buy Astral Media, the CRTC published a series of licence renewal applications, mainly from community, campus and other small stations across the country. Six of them are in the Montreal area, and their applications are summarized below. For the most part, the small stations were found in apparent non-compliance with obligations of their licences. This is not uncommon for non-profit stations that have high staff turnover and small budgets. For the most part these failures deal with two things that happen off the air: required financial contributions to Canadian content development, or the filing of annual returns and other reporting requirements. Under current policy, the CRTC deals with such non-compliance issues only at licence renewal time, and can decide among various options depending on the severity of the violation, up to and including non-renewal of the licence. The vast majority of the time, the response is to issue a short-term licence renewal (five years, three years or one year, depending on how short a leash they want). Each station was given a chance to explain why it apparently failed to comply with its licence obligations, and it will be up to the CRTC to decide what to do. In each case, the file is open to public comment and anyone with issues relating to a particular station can express those views to the commission. Below are links to each station’s application (in .zip format) and a link to file comments through the CRTC website. Are you a local artist who has fantastic musical talent but not the financial means to rent a professional studio to record your songs? Concordia’s student radio station might be able to help. CJLO 1690AM has received a $14,500 grant from the Community Radio Fund of Canada for its CJLO Artist Outreach Program, and it’s using that money to offer their services free of charge to mix and master an EP’s worth of music for a handful of artists. “The CJLO Artist Outreach Program aims to provide a stepping stone for local artists in the Montreal community to learn about how to get their music played on the radio and create a physical product that they can use to achieve this goal,” a statement from the station reads. Included in the deal is up to 70-80 hours of labour of a producer to record and mix the songs together into a 15-to-20-minute EP, and an “artist liaison” to teach artists how to promote the music. Because the funding is limited, so is the number of artists that can make use of these services. CJLO invites those interested to fill out a form on their website, and the station will select from among applicants. Station staff tell me that the plan is to benefit at least five artists with this fund, but aiming for more like 8-10, with some requiring more work than others. Applications are open until Feb. 15. Concordia University’s student-run television and radio stations are always looking up, looking for ways to grow. It’s been more than a decade now that both have gotten their funding directly from students instead of through the Concordia Student Union. They’ve since split their funding sources and have asked students for increases in their per-credit student fees. CJLO, the radio station, has been transmitting at 1690 kHz since 2008, out of an antenna in Ville St. Pierre, just down the hill from its Loyola studio. It produces a full schedule of programming, most of it music-based but with some talk and information programs as well. But the 1 kilowatt transmitter on AM doesn’t reach out very far, and many students don’t have AM radios. CUTV, the television station, has never had a broadcasting license. It can be seen on televisions on campus and on its website. Though it does produce a significant amount of programming, it’s nowhere near enough to fill a full schedule without repeating every program dozens of times. Both stations are looking to increase their reach through new ways of broadcasting, and to do that they each need more money, so both are in the process of asking students for yet another increase in their per-credit fees. In a referendum of Concordia Student Union members Tuesday to Thursday this week, CJLO is asking for an increase from 25 to 34 cents per credit. This works out to $10.20 a year for a full-time student taking five classes a semester. CUTV is asking for an increase from 18 cents to 34 cents per credit, which would almost double its funding. UPDATE (Dec. 3): Both questions passed, The Link reports. Following a rubber-stamp from the university’s board, the fees will be applied to students’ tuition bills. Here’s what they want to do to make themselves more accessible. The CRTC has said there isn’t more space on the FM dial in Montreal (106.7 is an exception, now that it has been vacated by Aboriginal Voices Radio and the pirate station KKIC, but an application is pending to use that frequency). But the city is saturated only in terms of high-powered stations. There are options available for low-power transmitters covering a small area, and this seems to be what CJLO is looking for – something just to cover the downtown campus, so students can tune in between classes. CUTV, meanwhile, doesn’t want to setup a broadcast transmitter, but it does want to get on cable television, where most viewers are anyway. CUTV’s plan is to apply to the CRTC for a community channel license, which would require cable systems to carry the channel. In the short term, the station is looking to get time on VOX, the community channel run by Videotron. Both plans are admirable, though the campaigns by both groups are tying the increased funding to the new broadcast licenses. Neither group has actually applied for one yet, and the likelihood of success is far from absolute. Getting a new FM transmitter in Montreal – even a low-power one – isn’t easy, particularly if it’s just retransmitting another station. The CRTC process is hardly a formality or a rubber-stamp. For CUTV, the group would have to convince the CRTC to give it a channel on the cable dial even though there already exists a television station in Montreal devoted to programming from its four universities – Canal Savoir. And it goes without saying that if these applications fail, neither of these groups is going to voluntarily reduce its student fee. Still, I wish them luck. CJLO deserves to be heard, and a low-power retransmitter covering just the downtown campus makes a lot of sense. CUTV, meanwhile, has a lot of promise, but without a continuous outlet there isn’t much incentive to produce sufficient quality of quantity of television programming. It’s not every day someone moves straight from hosting a campus radio show to hosting one on the commercial airwaves, but Nick Murdocco and Gary Whittaker have done exactly that. The hosts of The Franchise, a sports talk show on Concordia’s CJLO 1690AM, will be moving up the ranks and down the dial to The Team 990 (CKGM) to host a weekend morning show starting Sept. 12. You can take a listen to what kind of show they offer by listening to their podcasts. Reports are already coming in that the station can be heard across the border in Vermont. Radio watchers around town are noticing some strange noises high up on the AM dial. CJLO, Concordia University’s student radio station, has finally got equipment setup to begin broadcasting on its assigned frequency, 1690kHz, and is beginning tests. The CJLO saga goes way back to about 2001, when a real campaign to get it on the airwaves began. A Concordia Student Union vice-president remarked at the time that he expected it to be on the air by the end of the school year or 2003 at the latest. The station submitted its application to the CRTC in 2004 for use of the 1690kHz frequency, and the application was approved in March 2006, giving it 24 months to begin broadcasting (they were granted an extension to Oct. 1, 2008). The antenna is erected and connected in a mud pit in Lachine, just down the hill from the station’s Loyola home. The station is currently limited to short, 5-minute tests (mostly generated tones to test reception and range) until an inspector arrives to do his thing. Once that’s done at the end of August, the station can begin full testing and launch in the fall. More from the CJLO AM blog. Now, does anyone have an AM radio lying around? More importantly, one recent enough to have the extended AM band that CJLO is in?